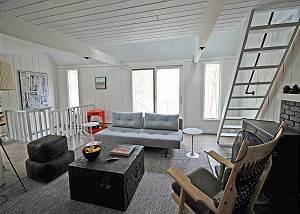 NEWLY RENOVATED, ARHCITECTUALLY SIGNIFICANT BEACH COTTAGE. CLOSE TO TOWN AND BEACHES, TUCKED IN THE LOVELY COMMUNITY OF SUMMER HOMES, WATERVIEW FARMS! 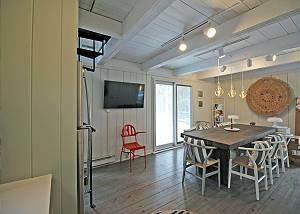 Gorgeous all newly renovated and newly furnished mid-century beach cottage designed by prominent interior design firm Tersigni Palachek as a modern vacation oasis in a historic waterfront community. This eloquent, yet rustic home offers three levels of living spaces, including a spacious loft, two master bedrooms and expansive deck. Tucked in the waterfront community of Waterview Farms, this home has access to association beach and dock on Sengekontacket, a favorite for those who love to kayak, windsurf, para surf and clam. 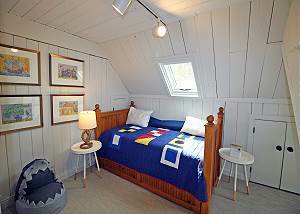 It is only about a half mile from Farm Neck Golf course, 2 miles to Oak Bluffs center, and 3 miles to popular State Beach. 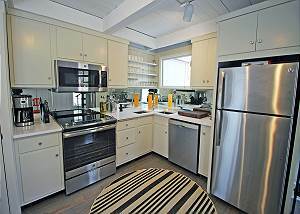 The central location provides easy access to multiple public beaches and the towns of Oak Bluffs, Edgartown and Vineyard Haven. The main entry level hosts a most attractive open dining and remodeled Kitchen featuring a blend of contemporary and farmhouse décor and a 52-inch QLED TV. Glass sliders open to the expansive 900 square foot deck and outdoor living area with sectional sofa and chaise lounges. Dine alfresco with outdoor dining for 8 and a 4-burner gas grill. This level includes two spacious master bedrooms, one with 65-inch QLED TV with surround sound and cathedral ceiling, and both with AC. They are nicely spaced for privacy with the newly renovated bath set between them. 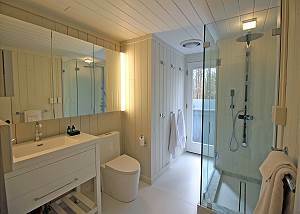 The bath includes a glass step in rain shower and body jets, and direct access to the enclosed outdoor shower, a favorite with visitors of the island. A spiral staircase seen in the photos leads to the 2nd level living/media area which includes a 65-inch QLED TV with surround sound, sofa seating, home office area and glass sliders to an additional deck overlooking the protected lands adjacent to the property. 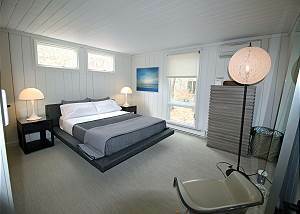 Tucked just off the living area is a whimsical bedroom with trundle bed. The 2nd newly updated bath with step in rain shower is located on this level. 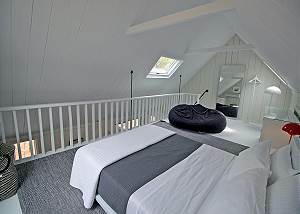 Above the living room is a spacious and inviting loft bedroom for relaxing among the treetops in the Queen bed nicely cooled by the AC servicing the loft and living area below. 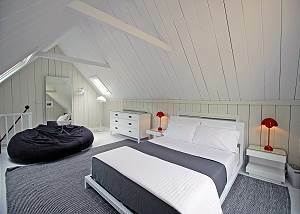 Additional Info: The home is equipped with 3GB super high-speed internet, Leesa memory foam mattresses and cooling pillows, and 800 thread count Turkish linens. Upon arrival you will find a welcome bottle of Veuve Clicquot Brut and Hermes amenity package! Bike paths are located right at the end of the road! Kayaks can be rented, delivered to and stored at the community waterfront area. Please inquire with agent for rental company info! The nearby village areas of each town display uniquely different New England coastal characteristics and feature family and fine dining establishments, boutique shopping, movie theaters, bakeries, fish markets harbor front areas, full service grocery stores, a variety of supply stores, and a plethora of galleries. -The private beach and dock are .25 mi from the house, a nice stroll through open lands, and about .4 mi to Pecoy Point.